Brazilian health workers on Monday moved to stem an outbreak of measles being brought by Venezuelans, many famished and sick, who have fled their homeland amid economic and political turmoil. The initiative follows a measles outbreak that has affected more than 1,000 people and killed five children, coming shortly after the disease was eradicated in 2016. 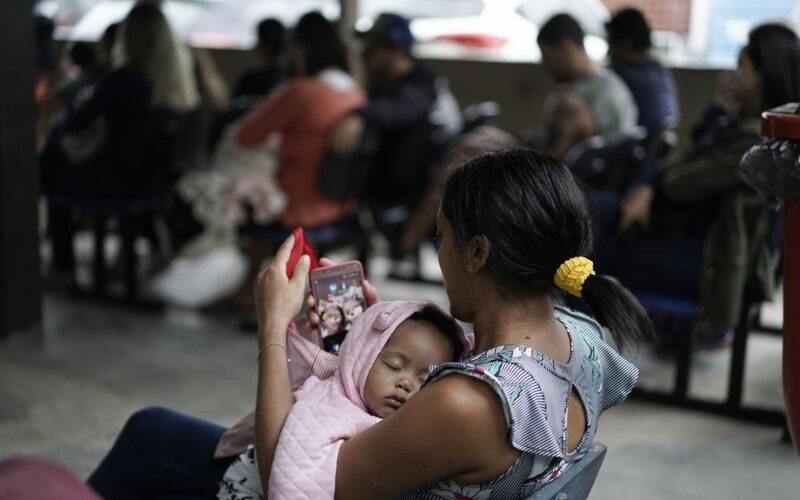 The measles cases are mostly concentrated in the northern states of Amazonas and Roraima, where thousands of Venezuelan refugees are crossing the border and trying to rebuild their lives. Many are sick and haven’t been immunized, as their country’s health system is in crisis. That was the case from 2000 to 2013, when most Brazilians were protected against the disease, and stopped any imported measles viruses from spreading. But last year, only 70 percent of the population received both doses of measles vaccinations. Spread by coughing and sneezing, measles is a highly contagious virus that causes symptoms such as runny nose, rashes and vomiting. It can be fatal if not treated. Brazil, which is slightly larger than the continental U.S. and includes large swaths of jungle, has experienced several types of outbreaks in recent years. In 2016, the country was at the center of an international outbreak of the Zika virus. Last year, authorities launched a big campaign against yellow fever, which spiked after several years of relatively low numbers of cases. This year’s vaccination campaign, which goes through August, is also targeting polio, which health officials worry may return to Latin America’s largest nation because of a slowing down of vaccinations. In the states with the most critical situations, health workers have in recent weeks been giving out free shots in clinics and going door-to-door. Now authorities want to go back to full coverage on a national level: The goal is to vaccinate at least 95 percent of children aged 1 to 5 by the end of the month. The Ministry of Health has been advertising the campaign for weeks, and even recruited popular children’s entertainer Xuxa – known as the “queen of the little ones” in Brazil – to be the celebrity spokesperson. On the first day of the campaign, lines at Rio de Janeiro health clinics were relatively short. In the state of Rio de Janeiro, 14 cases have been confirmed, a small number compared to northern states, but some families ventured into the rain to make sure their children were protected. Michelle Souza, a 34-year-old teacher, brought her 2-year-old son Morilo to a center in the Cidade de Deus neighborhood in western Rio. “I got really worried because it’s been a while since we heard anything about measles. And now the disease is spreading in some regions,” she said. On the other side of the city, Ednea Fernandes, a 39-year-old seamstress, brought her son to the immunization clinic in Botafogo even though the 5-year-old had already gotten all his shots. Turnout in the beginning of vaccination campaigns is often low in Brazil, but Ballalai hopes that awareness about the outbreak will keep growing, and that families will take their children to get vaccinated. On Aug. 18, the high point of the campaign, more than 36,000 clinics will be open. “In previous campaigns, there wasn’t necessarily that call to save your child. So people didn’t show up,” she said.